One of the top tips in our recent guide to winter cycling was to keep your bike properly maintained. But what does this involve? While you might be able to get away without doing very much in the summer, in the winter you do have to a do a little bit more. The reward is that your bike will carry on running smoothly, and in the long run, you’ll save money by extending the life of your components. You can do most winter bike maintenance yourself, but always take your bike to a professional if you are not sure. When you go out on your bike in the winter, there’s a good chance that by the time you get back it’s going to look... less than spotless. Water, grit, and worse still road salt, are bad news for your frame. Especially if it’s steel or aluminium rather than carbon fibre. For this reason, even if you don’t have time to fully clean it, you should give your bike a quick wipe down after every ride. Above all else, make sure your bike is dry before you put it back in the garage. Ideally, give your bike a more thorough clean. We discussed this in our winter riding tips post, and touched on it above, but it’s worth saying a third time. Keeping your bike clean is the number one thing you can do to prolong the lifespan of your components and avoid problems when out on the road. At least once a week, give your pride and joy (or even your winter beater bike) a full clean with warm, soapy water and a bike-specific cleaning product. A clean bike is a fast bike. And as an added bonus, they look better too. When you’ve finished cleaning your bike, take the time to re-lube your chain and check key components for wear. If you’re buying some bike degreasers and cleaners, make sure you get some oil and grease too. There are two main types of lube. Wet, and dry. Although dry will not pick up as much dirt as wet, you’ll find that it’s quickly washed away by even the slightest bit of rain. As a result, you’ll need to keep reapplying it throughout winter. In fact, it may not even last for the whole duration of your café spin or winter training ride. If you plan on riding whatever the weather, we recommend using wet lube. Wet lube will keep you going for even the longest of winter rides, and provides a little extra protection against snow or slush. The downside is that because wet lube is a little ‘stickier’ than dry lube, it will pick up dirt more quickly. In winter, the roads are always muckier than in summer - even on a fairly dry day. This can quickly result in thick black grim accumulating on your drivetrain. To avoid this and keep your bike running smoothly, you will need to degrease and re-lubricate your chain every couple of rides. Doing lots of winter riding will wear down your brake pads more quickly than normal. These are cheap enough to replace, but if you leave dirt and grit on them, they’ll wear down your rims too. New rims are much more costly. Always check and clean your brakes after cycling in the winter. Checking disc brakes is a bit more involved as you will often have to remove the pads to see how worn they are, but is still worth doing. Cables too, can become gummed up with road dirt if not kept clean. Keeping on top of this, and adding a drop of oil if required, can help expand the life of your cables. 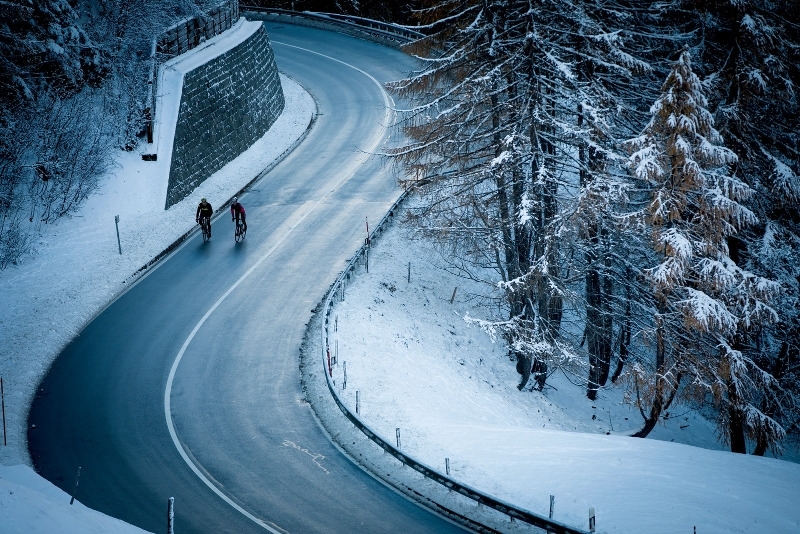 Brakes aren’t the only part of your bike that wears down faster in the winter. Your chain and cassette will also need replacing sooner. If you replace your chain in time, you should be able to get two or three chains per cassette. Fail to do so, and your cassette will need replacing sooner. A new cassette costs a fair amount more than a new chain, so trying to prolong the lifespan of the latter is a something of a false economy. You might not notice that your chain is stretched (unless you let it get so bad that it starts jumping and skipping) so use a measuring tool to determine when it’s time for a new one. If you don’t have one of these, a rough method is to put your bike in your biggest chainring and pull one of the links. If you are able to move it more than a few millimeters from the chainring, the chain is stretched. Bearings will also need more attention in the winter. Before the weather turns, make sure they are all well greased. This helps keep water out. After winter, it's a good idea to either repack the grease or buy new sealed cartridge bearings. This applies to the bearings everywhere on your bike: in your hubs, headset, and bottom bracket. You may need to take your bike into a bike shop to get this done, particularly where the bottom bracket is concerned. Got any other winter maintenance tips? Leave them in the comments below.